What's liberation got to do with it? 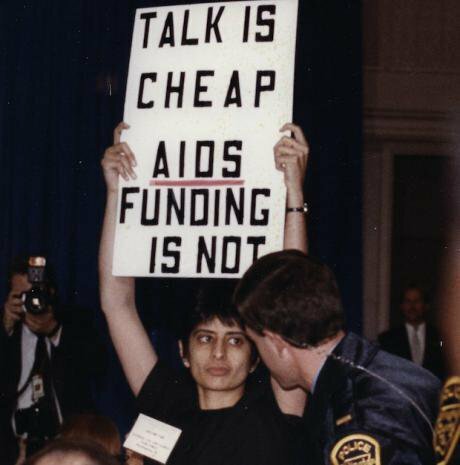 Veteran activist Urvashi Vaid on being a utopian in the 1970s, and how gay rights prevailed over liberation politics. Part of Transformation's liberation series. 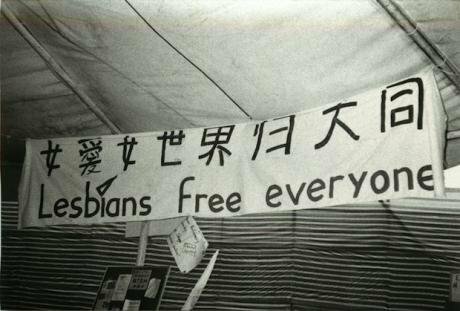 Lesbians free everyone, 1995. Credit: Urvashi Vaid. All rights reserved. As a 17-year-old student in the US in 1975, I believed in utopia and struggle. I was an idealist with a practical streak. Utopia meant what it has to legions of progressives – socialize the benefits of prosperity to all people, and privatize the risk. We would get there through struggle. Social movements were my home. I believed in their power – the women’s movement, the anti-apartheid movement, the movement against urban redevelopment, the anti-nuclear movement, the gay liberation movement, the racial justice movement. We printed brochures at Come-Unity press in New York, bartering with toilet paper and paper towels from our college bathrooms. I joined LUNA (Lesbians United in Nonnuclear Action) in 1979, while I was also volunteering for radical weekly Gay Community News, organizing against violence against women with a neighborhood association, and protesting US intervention in El Salvador. Liberation was the banner under which any young person with a political conscience marched. My understanding of liberation did not come from the feminist and gay activists with whom I worked, but rather from movements working to end colonial occupation and white supremacy. The African National Congress, who defined themselves as “a national liberation movement,” were my heroes. To be for liberation meant to work for self-determination and freedom – in the Soviet Union, China, Nicaragua, El Salvador, South Africa and the US. Through the anti-apartheid movement, I met a young radical Episcopal priest named Frank Morales who exposed me to another dimension of liberation. Frank worked at a parish in Poughkeepsie, until his radicalism got him moved to the South Bronx, where his radicalism got him moved again. Frank’s values were grounded in liberation theology, and the work of Gustavo Gutierrez, James Cone, James and Grace Lee Boggs, among others. We talked a lot about praxis. Even as a non-Christian radical lesbian, I understood what he was talking about. Social justice work felt like a moral calling. And it was work I did on many levels. My gender and sexuality-based self-hatred was as much my enemy as external state repression or societal marginalization. Liberation theology taught me that achieving justice was a process and an outcome. As I grew more active, I affiliated myself with the liberationist wing of the lesbian, gay, bisexual and transgender (LGBT) movement. Here liberation meant the difference between a broad, intersectional politics and a narrower gay rights-focused one. The former was a politics whose goals were always framed as “both/and”: opposing discriminatory laws and compulsory heterosexuality, securing family recognition for queers and ending patriarchy, being feminist and ending gender and sexual binaries. This was the politics of the radical wing of the queer movement – it had existed before I came along and it exists today. But it was gay rights not liberation politics that prevailed. The mainstream gay rights movement came to organize itself around claims of equality, not difference, or even justice. It was simpler to pursue equal protection than substantive justice, seek to be “in-laws” rather than revel in being sexual outlaws. Equality as it is currently articulated in the LGBT movement represents a politics of compliance with liberal capitalism rather than a commitment to ending the exclusions the system perpetuates. Equality is a fine aspiration. It’s simply not enough. As the legal scholar and activist Dean Spade argues, declarations of legal equality by the state “leave in place the conditions that actually produce the disproportionate poverty, criminalization, imprisonment, deportation and violence trans [and LGBT] people face while papering it over with a veneer of fairness.” The conviction that legal and policy reform (formal legal equality) will change people’s lived experience (lived equality), and that rights once achieved will be evenly distributed, runs deep. US history shows both of these convictions to be false. After the passage of the 1964 and 1965 Civil Rights and Voting Rights acts, the civil-rights leader A Philip Randolph observed that the movement suffered from the “curse of victory” in which equal rights had been achieved but “blacks still were not equal in fact.” Formal equal rights were a crucial first step; next had to come the struggle for black empowerment, freedom, and respect. 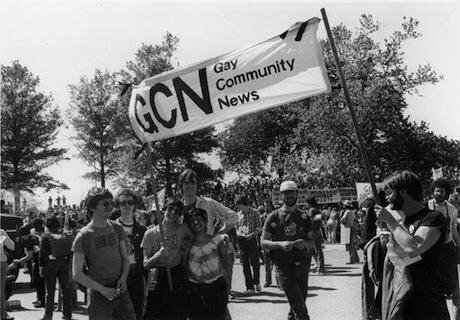 Gay Community News at a 1981 demo against US intervention in El Salvador. Urvashi Vaid third from right. Credit: Ellen Shub. Today the institutionalized structures of white supremacy are evident in every arena, from disparities in health care access and health outcomes, to education systems failures in urban contexts, to the disproportionate criminalization of people of color. Equality was not enough. Similarly, the women’s movement won many formal legal gains, and these achievements created new opportunities. But legal equality did not remove the glass ceiling for women in the workplace, nor end violence against women, nor transform women’s role in families, nor produce equal pay for equal work—men still earn $1.22-$1.32 to every dollar a woman earns, and that's only for white women. Being of colour only increases the disparity. Legal equality is also experienced differently by differently situated people. The women’s movement secured abortion rights in the early 1970s through a Supreme Court decision and in the same era achieved many reforms in a wide range of discriminatory laws. But poor women were immediately denied access to publicly funded abortions by the passage of the Hyde amendment. Today, neither the framework of rights, nor the framework of liberation, is adequate. What is needed is a politics centered on ending poverty and expanding opportunity within and outside the LGBT movement. A focus on the survival and thriving of people, communities and the environment is a project of redistribution not liberation, of material solidarity not liberal ideas. Such a politics is by definition particular, plural, not homogenous, as are the lives of LGBT people. A focus on lived experience takes race, economic status, gender, gender identity, ability, among other variables, into account, because these are part of what different queer people face. Its goal is to tear down and rebuild the current form of oligarchic, nationalist capitalism into a more societally accountable and responsible engine. How can social movements like the LGBT movement wield their creativity, political power and new status to build a world that does not privilege the lives and property of some while usurping and destroying the life chances of others? A justice-oriented LGBT movement would start by ensuring the survival of all members of its community, to end poverty and violence. Tapping the economic privilege of some of its members, and combining the LGBT movement’s newfound political clout with the age-old queer experience of being outsiders, such a movement would seek jobs for all and a stronger social safety net. It would work against the racial inequalities that are the legacies of racism and colonialism by foregrounding issues like criminal justice, sentencing reform and disproportionate policing and incarceration, disparities in health care access and care, HIV/AIDS criminalization, and wider access to HIV treatment. Such a movement would address LGBT youth homelessness by developing innovative mechanisms to finance new housing. Further, a poverty-focused movement must realize that a focus on lived experience alone is not enough to forestall the environmental catastrophe, war-fueled violence, health disasters, and economic and resource based inequalities traumatizing millions of people today. To liberate the future, social movements need to build power to overcome forces of resistance. Movements need strategies to win gains, but also to win governing power that can defend and stop the encroachment of progressive gains by reactionary forces and movements. The chief reactionary force that threatens social justice movements (including the LGBT movement) is neoliberalism. Neoliberal policies have a paradoxical effect: they reduce the funding available for social services, but they increase demand for services through increased unemployment, dislocation, inequality, poverty and the abandonment of people who were previously supported by a social safety net. One byproduct of this new demand is the rise of the nonprofit sector. The scholar Miranda Joseph insightfully argues that the nonprofit sector has become a metonym, a substituted concept, for the idea of community, at the very instant that such community has been undermined by neoliberal economic policies. Refocusing on poverty and survival provides a very practical and long- range agenda for activists. And it moves us away from arguments between rights and liberation, equality and freedom, belonging and transforming, and towards experiments in a new practice (new organizational forms, new alliances, new objectives) that as its goal the survival and flourishing of those considered disposable by capitalism and patriarchy. In an historic address against the Vietnam War in April of 1967 titled A Time to Break Silence, Martin Luther King Jr called for a shift in the focus of the civil rights movement from racial justice alone to a broader focus on economic, social and global justice. Is it possible to challenge and channel capital’s dominant power in these ways? As a radical, still an idealist, I still answer yes. It is possible for movements to shift and hold capital accountable, and to redeploy its productive power in socially valuable ways. This is not the liberation of which I dreamt as a teenager. Yet, organizing to win the power still matters. It allows social justice movements to shape the systems and structures that distribute resources. And this is what will enable LGBT activists to truly create the possibility for freedom.